When my family first started our natural living journey, we didn’t have the financial means to purchase lots of different products and ingredients. Money was definitely tight as a single income family. 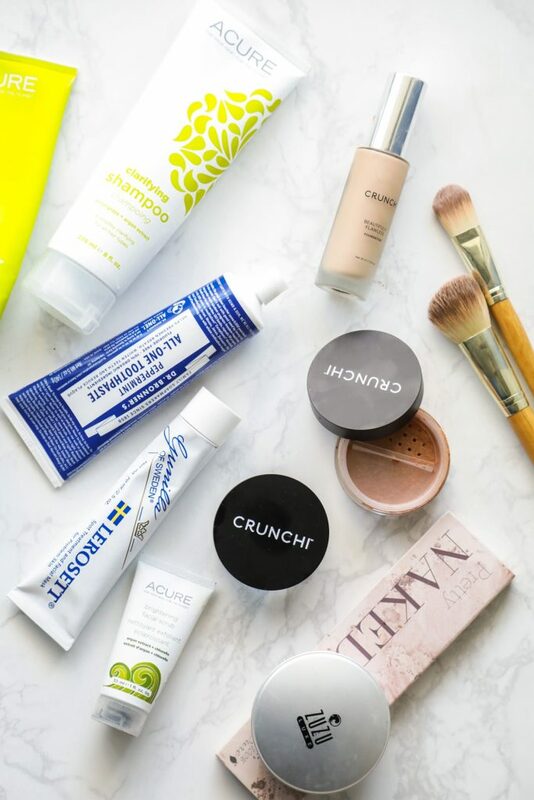 In an effort to maintain both my mental sanity and our financial stability, I had to figure out how to make the switch from toxic products to more natural options. My solution was a simple one: Embrace this makeover as a journey. A slow, steady journey, swapping one product at a time. I want to help you do the same. That’s why each month we chat about how to practically make the switch from toxic products to more natural products. So far we’ve talked about making the switch to natural toothpaste and dish soap. Today, let’s talk about a cleaning product that most of use daily in our homes: all-purpose spray cleaner. Unlike body and personal care products, companies aren’t required to list all ingredients on a cleaning product label. And since cleaning products aren’t ingested, the ingredients are not regulated by the Food & Drug Administration. 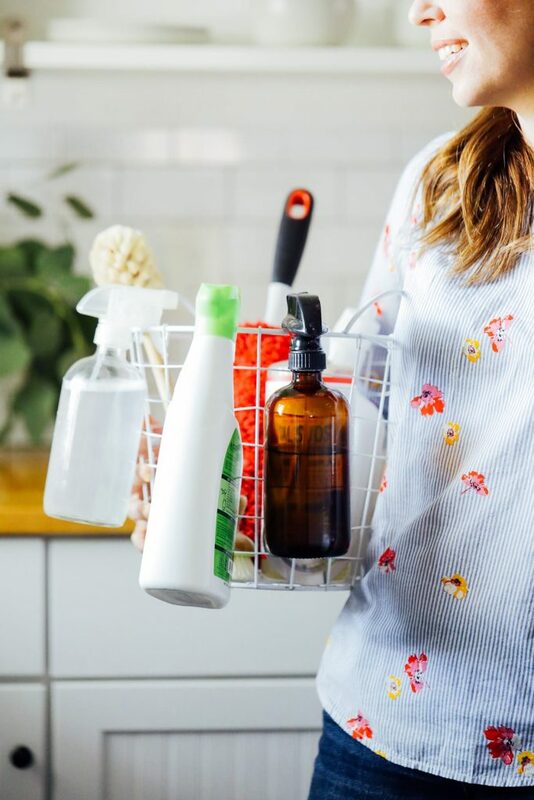 Because of this, it can be hard to know what cleaning products are more natural and what products are potentially harmful. The easiest way to determine this is to search for a product’s rating on either the Environmental Working Group’s website or the Think Dirty App (both resources are provided by consumer watchdog groups). I aim for an A or B rating on the EWG site, or a 0-3 rating on the Think Dirty App. My goal with every “make the switch” chat is to provide you with a list of my favorite products in a particular category. 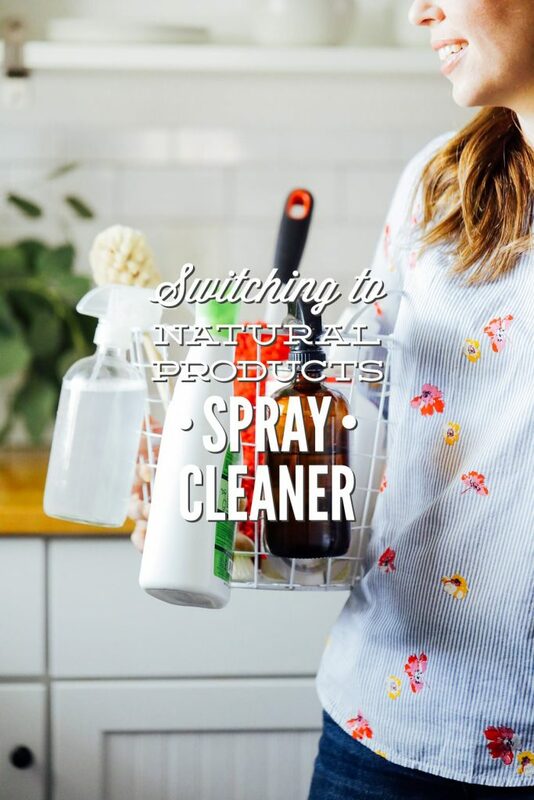 My favorite all-purpose spray cleaner list includes a couple of store-bought products, a couple of online products, and a few homemade solutions. The list certainly isn’t exhaustive, so I also encourage you to use the EWG and Think Dirty resources to do your own research. In a 16-ounce spray bottle, combine 1 cup of distilled water, 1 cup of white vinegar, and an optional 15-30 drops of essential oil: lavender, peppermint, grapefruit, orange, or lemon. Seal the bottle and shake to combine the ingredients. Store the cleaner for up to 3-4 weeks. Shake between uses. Sal Suds is Dr. Bronner’s tougher version of castile soap, although its chemical makeup makes it a detergent, not a soap. 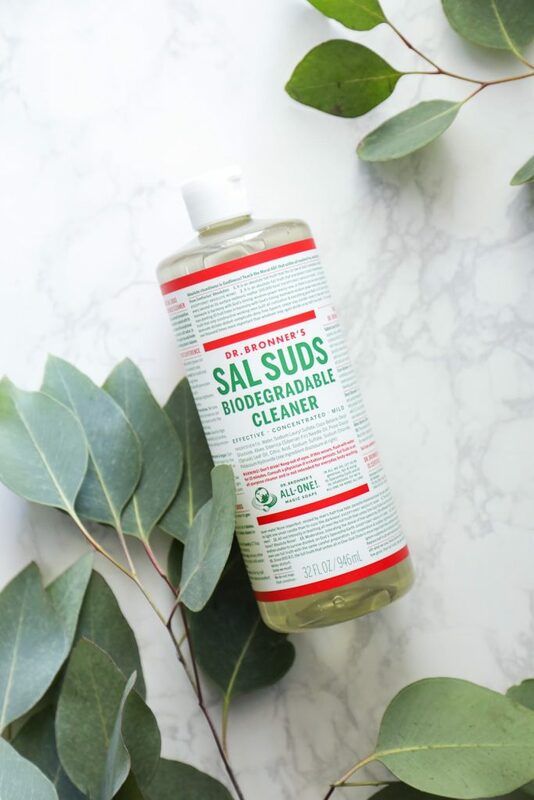 Sal Suds is formulated to conquer unforgiving grease and stubborn dirt. I like to combine Sal Suds with vinegar to make an all-purpose spray. 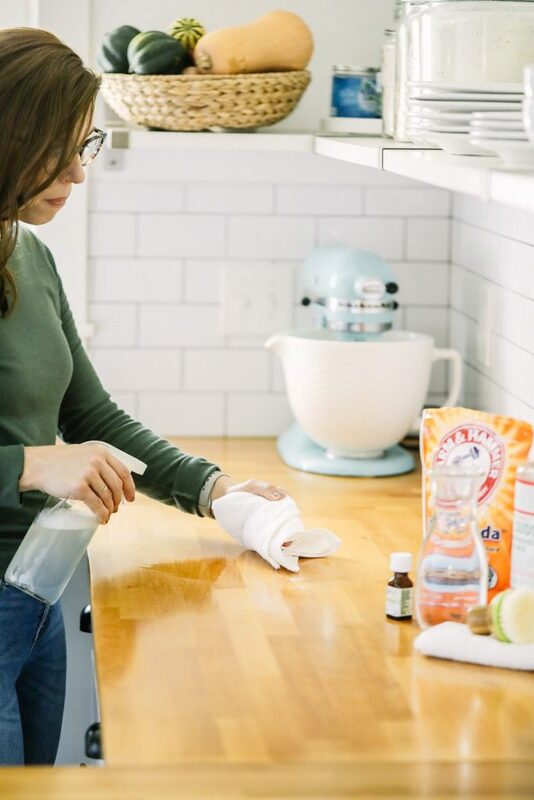 In a 16-ounce spray bottle, combine 1 cup of distilled water, 1 cup of white vinegar, 1/2 tsp of Sal Suds, and an optional 15-30 drops of essential oil: lavender, peppermint, grapefruit, orange, or lemon. Seal the bottle and shake to combine the ingredients. Store the cleaner for up to 3-4 weeks. Shake between uses. In a 16-ounce spray bottle, combine 2 cups of distilled water, ¼ cup of castile soap, and an optional 15-30 drops of essential oil: lavender, peppermint, grapefruit, orange, or lemon. Seal the bottle and shake to combine the ingredients. Store the cleaner for up to 3-4 weeks. Shake between uses. This company has won my heart and cleaning caddy. 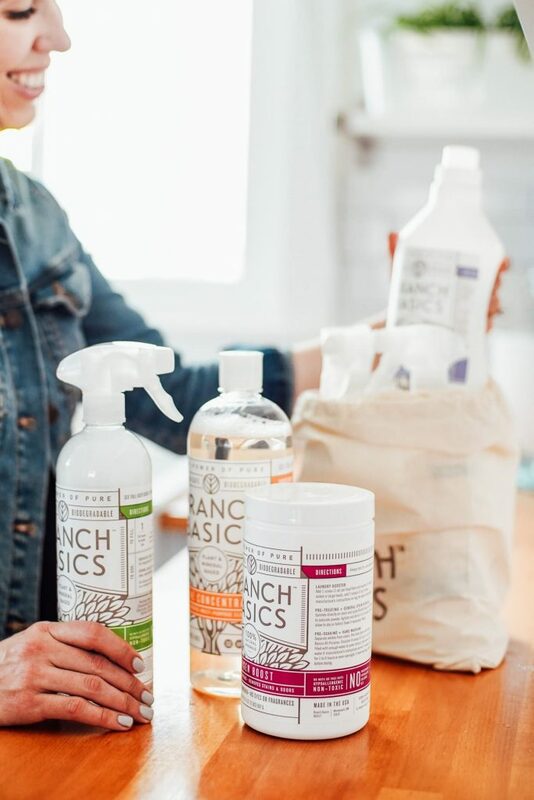 Not only are the founders of Branch Basics super transparent about their ingredients and have a deep passion for teaching people how to get rid of toxic chemicals in their home, the products they sell really work. I say products, but really there is only one main cleaning product: the concentrate. 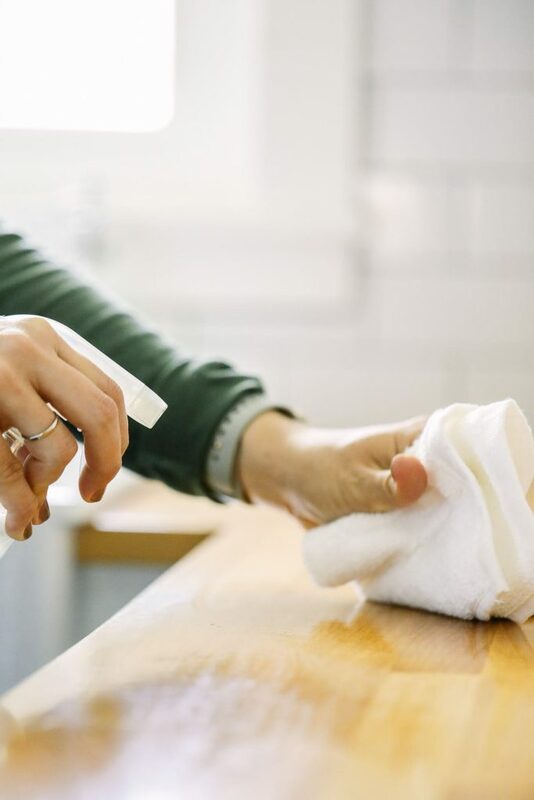 With this one product, you can make multiple cleaners to use in your home, from all-purpose cleaner to laundry soap to hand soap. Branch Basics sends you all the bottles (which include how much concentrate to water you need to mix together) along with the actual concentrate. Once you have the bottles, you simply need to replace the concentrate as needed. This is my favorite store-bought, ready-to-use spray. It’s easy to find in most grocery stores and inexpensive. The cleaner receives an A rating from the Environment Working Group and a 0 from Think Dirty. This option isn’t as easy to find as the Seventh Generation spray. If you stumble upon it in your local grocery store or a health food store, I recommend giving it a try. 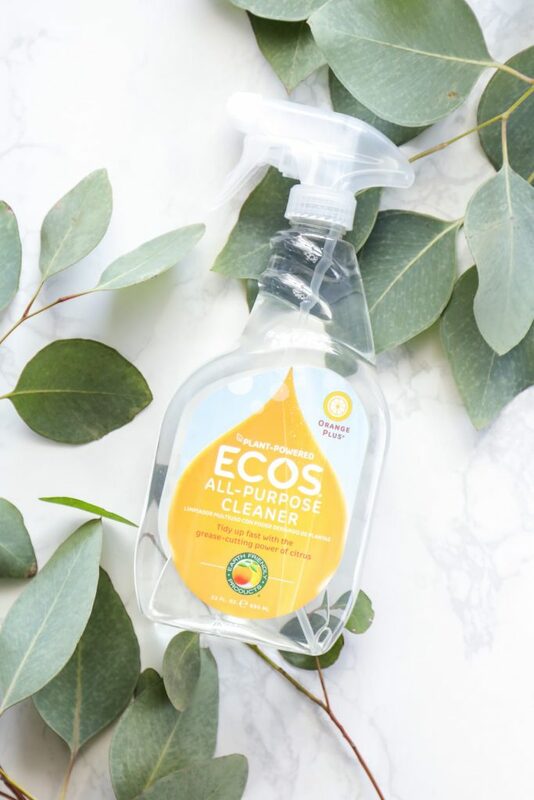 This cleaner receives an A grade from the EWG, is affordable, and can be found at many different stores (from Walmart.com to Whole Foods). It has a wonderfully subtle orange scent that feels fresh but not overpowering (the trademark of a good, naturally-scented product). I want to hear from you in the comments section! Tell me what you’re working on swapping in your home, what you’ve already swapped, what you want to swap in the future, and any all-purpose cleaners that you particularly love (or don’t love). Hey Kristin, thanks for this awesome review of all-purpose spray! I am so excited to get this one for me as it serves you all purposes! I’d love to hear which one you try, Evelyne! Let us know if you decide to try to make the Truce spray yourself! I’m not sure I can justify the cost after using homemade products for a while now. Plus it just plain feels good to make stuff yourself! I’ve been using the recipe from your reusable floor wipes, but in a spray bottle, on the floor and nothing beats it! And I like the sal suds/vinegar spray on my counters. That DIY kit from The Optimist is awesome as a gift! I’m not sure I could make my own DIY kits for gifts for that price, but might be fun trying. Hey Tamara, Definitely. 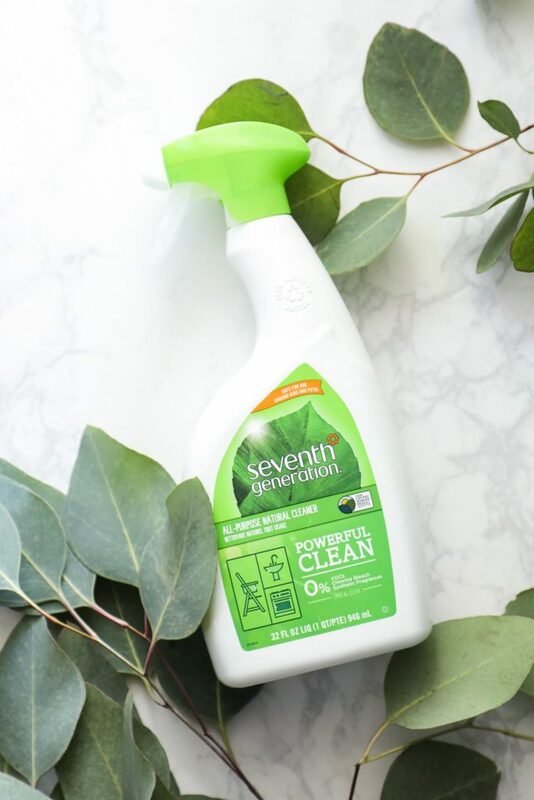 I’ve been thinking about creating a similar cleaner since the ingredients are so easy to find. I’ll let you know if I do! Another step I take to further reduce costs is to save my citrus peels in the freezer. Once I have enough to fill a quart size, or you could do pint, jar I pour vinegar over the peels and let them sit for 2 – 4 weeks. Then I use this vinegar in my cleaners. I’ve done the same with lavender and other herbs from my garden. If you start a new batch as soon as you decant your first you’ll always have some ready. Works great for chicken coops as well. Oh yes, I completely forgot about that, Katie! Thank you for sharing! That is a wonderful idea! Thank you. I was so excited with your cleaner recipes that I purchased the castile soap and the Salsuds! My one question is this: you mentioned the recipes are good for 3-4 weeks and I wondered why? Do the ingredients lose their effectiveness? Thank you for your time and your awesome site! Hey Tammy, Awesome! Since preservatives aren’t used, it’s best to use water-based products quickly to prevent bacteria contamination. Hi Kristin! I’ve taken to cleaning my kitchen counters, bathroom counter, and toilet wit two different sprays: an initial spray/wipe down with your half vinegar, half distilled water mix and another spray/wipe down with straight hydrogen peroxide for its disinfecting properties. 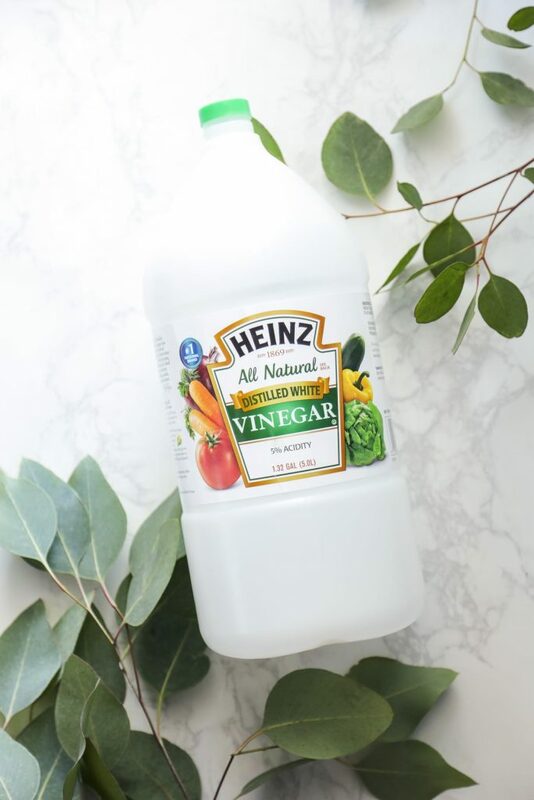 I noticed hydrogen peroxide in a couple of ingredients on this list and would love your feedback on this method! I’m tempted to move toward a single spray, but I really want the disinfectant in there somewhere. Thanks for all you do — I so enjoy your blog! Hey Laura, I think that’s a great method. It’s a method that’s been studied and researched, too. You can’t combine vinegar and hydrogen together, so this is the best thing. I would keep it up.